PORTLAND, Ore. (KOIN) -- It's been nearly two weeks since a catastrophic fire in Wilsonville forced 25 people to flee their homes. Officials still haven't determined a cause for the fire that destroyed six homes and damaged several others, but investigators have released new witness video they hope will help answer some questions. The video shows a Jeep, a late 90s, early 2000s model, driving through the Villebois neighborhood at 12:49 a.m. on March 31 -- the morning of the fire. The car is not considered a suspect vehicle. Authorities just want to talk to the driver as a possible witness. 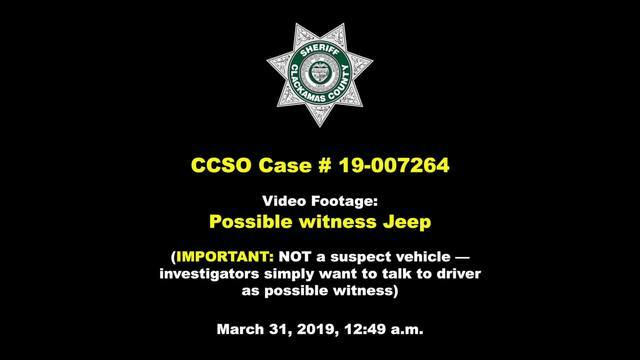 The driver or anyone who can identify the driver is asked to contact Clackamas County Sheriff's Office as soon as possible. Anyone who shot video between 11 p.m. on March 30 and 3 a.m. March 31 is also asked to contact the sheriff's office.